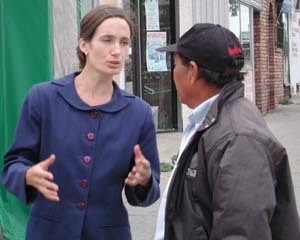 Lisa Rottach, the Socialist Workers candidate for governor of Nebraska, campaigns in South Omaha on August 18. Rottach and supporters handed out leaflets, and sold the Militant, Perspectiva Mundial, and Pathfinder books. South Omaha is home to thousands of workers in the Nebraska meatpacking plants. "We received a very enthusiastic response to the program of our campaign," said Rottach, adding that one worker told her, "it’s important you’re out here because nobody else tells the truth about what we workers need."